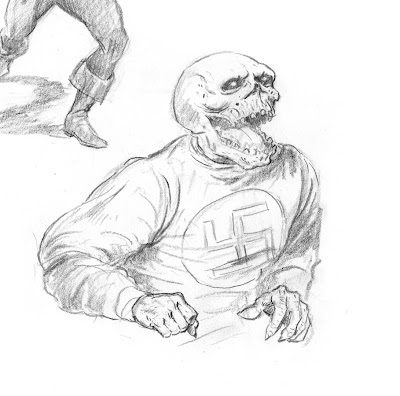 This is a funny sketch of the Red Skull. All right. Enough fun. It's time for some extremely dry information: my digital technical specifications. I can't think of anything more exciting (which is probably why I am writing about it). I should also note that some of you "asked for it." I work on a 24" 2.4 GHz Intel iMac with 3GB of RAM. I love this computer. I watch movies on it. It's ginormous. It's the technological hub of my life, both personal and professional. I use a 4" x 6" Wacom tablet. Aside from the pressure sensitive pen, the best feature is the keypad on the left, which can be programmed to your specifications. I use the touch strip while in Photoshop to change the brush size easily; in the rest of my applications, it acts as a scroll bar. The active area is tiny and I love it because my hand doesn't have to move much. I tried out a Cintiq once and my arm quickly exhausted. That's beyond the fact that there was an unacceptable delay between my pen stroke and the result. And that's beyond the fact that a big, dark hand interferes with one's color perception on a glowing background. My printer is an Epson R260 6-color printer. The extra 2 colors are light cyan and light magenta. These aren't really 2 new colors, but they make a fainter dot so that light areas in an image won't be made of dark dots, spaced further apart. The result is smoother tones and higher-quality prints. I use an Epson 3490 Photo Scanner. Good. Cheap. Loud. I'm not even sure if they make it anymore. I scan all my 11" x 17" comic art sideways in three sections, stitching them together automatically in Photoshop with Photomerge. I curse the day I had to stitch these together "by hand." Whenever I have a spare 2 grand lying around, I'm gonna get the 10,000 XL. I'll let you know when that happens. I just bought the newest version of Photoshop as part of Adobe Creative Suite 4 Design Premium. In addition to Photoshop, the package includes Illustrator, InDesign (which I don't know how to use, but will probably need when I do my own book some day), Dreamweaver, Fireworks, and Flash (which I'm also clueless about). Begin rant: This one goes out to the students. I know you know a guy who knows a girl whose roommate's uncle can get you a copy of CS4 with a cracked code. I don't blame you for wanting to go that route. The program is expensive and you don't have a job. Get the educational discount whilst you can! That will cut the price by 50% and it will be treated just like the pro version when you upgrade. In the meantime, you get all the bells and whistles at half the price, allowing you to learn the programs that you will probably be using for the rest of your life. You also won't have to turn off the internet at various times so that Adobe won't find your unlicensed software. And, most importantly, you can stop asking me for a copy of mine. End rant. I scan the typical painted cover at 400 ppi. I used to scan at 266 ppi, which is fine for what I need, but I like having the option of enlarging images (I also have more hard drive space these days). I save a TIFF of the original scan, as well as a 1000-pixel tall JPEG for my art dealer. Once I've shrunk the file to final print size, converted it to CMYK, and done all my edits, I save a PSD file, which keeps the adjustment layers intact. The final file sent to Marvel is a flattened version of the PSD, a TIFF with LZW compression measuring 6.875" x 10.4375" at 400 ppi (2750 x 4175 pixels). I also save a 593 x 900 px RGB JPEG of the final version for my editors (and this blog). I hope these answers helped some of you. If you have further questions, feel free to ask in the comments section. Pretty cool! As a user of a cintiq, I can understand your complaints about it. My main complaint is that the darn thing will never be correct in its color output, and I have to be conciously aware of it. I'm rubbish with using a normal wacom, though, so having the ability to draw like that into the computer is a boon. When computer coloring a comic page or cover, do you work on the color image at final print size or do you color it larger (as you would with most traditional media) and then reduce it to print size at the end? Drew, I've heard that from a lot of people about the tablet. I think I'm just really used to it at this point (I've had one for almost 10 years now). As for CS4, I haven't really been able to utilize all the new features yet, simply because of the kind of work I've been doing. However, one thing I loved immediately was the crisp image at every level of zooming. It seems like a simple thing, but it means a lot when I'm working. I work at the dimensions that Marvel requires, which is 2750 x 4175 pixels. That's 400 dpi when printed at actual size, though I have a hunch it's printed at a lower quality. That size means they can enlarge it for other purposes, if need be. Also, the above information is primarily for my painted work. I'm putting together a step-by-step feature for my pencil/ink/color work. The final output specs are the same, but I take a different route to get there. Thanks for the tip about Photomerge Paolo. I've had CS4 for a while now and hadn't even heard of the feature. My little scanner frustrates me to no end with the 11x17 pages, but the photomerge goes a long way in the right direction. Oh, and I don't think I've left a comment before, but I'm a big fan of your work. I love coming back to this blog. Thanks for posting this man, much appreciated! I'm always confused at the technical stuff and it's nice to have a guide to go by. Thanks Paolo - I'm working on my first comic now and the tech specs (esp. pixel dimensions) make for one fine resource. Also just cool to hear how you go about your business. BTW - my "word verification" to post right now is "breverse." The dork in me couldn't help imagine that this is what Tom Brevoort calls his own personalized history of the MU.